A reeling drunk in a suit stumbles out of a bar and into a dark New Orleans alley for a slash. As he braces himself against a wall and does his business, a girl turns down the alley, and the man holds up a police badge—to make her more at ease about the presence of a micturating lush along her path, we assume. Suddenly a beautiful woman wearing a grey silk gown and matching surgical mask bumps into the girl. “Do you think I’m pretty?” the masked woman asks. “No, I think you’re crazy” is the wrong answer—the masked woman slashes and stabs the girl with a huge pair of dressmaker’s shears. The cop turns and empties a full clip into the woman, but the bullets have no effect. The girl is dead, the woman is gone, and the cop is wigging. Jasper’s place, meanwhile, is a model of domestic tranquility. Chas is making salad, Zed is poring over the stigmata map, and John is merrily smoking and repairing a zoetrope. He spins the device for Zed in order to kick her psychic mojo into gear. It works—she has a vision of a boy named Jimmy, with a woman teaching him how to shoot a gun, “in case he comes at you again when he’s drunk.” Then Chas looks at the previously dry map: “Incoming!” New Orleans is bleeding. Zed has established a psychic connection with the map, as Constantine intended. The whole team arrives at the New Orleans alley crime scene, where they meet the policeman who failed to prevent the murder the night before—NOPD Homicide Detective… Jim Corrigan. Whoa! The drunk cop is the Spectre! (Or will be the Spectre—we don’t know yet; we’re just intrigued that there’s a DC character who dates back to the Golden Age now in the mix.) 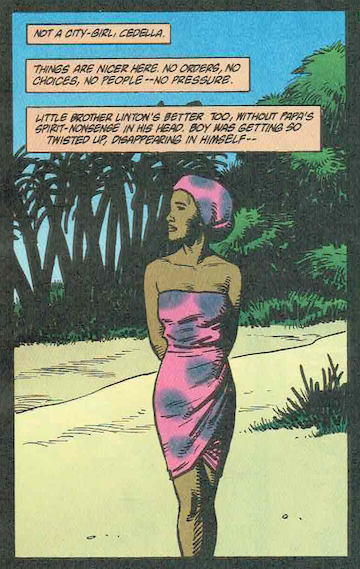 In the dead-tree DC universe, Corrigan and Constantine met when, as a member of the “Trenchcoat Brigade,” John introduced young Timothy Hunter to the world of the supernatural in Book II of the original miniseries of Vertigo’s Books of Magic. But we’ll try not to get ahead of ourselves—as far as the show is concerned thus far, he’s no more than a troubled cop. Zed recognizes him as the grown-up Jimmy from her vision. (He thinks he recognizes her too, but we’ll get to that.) 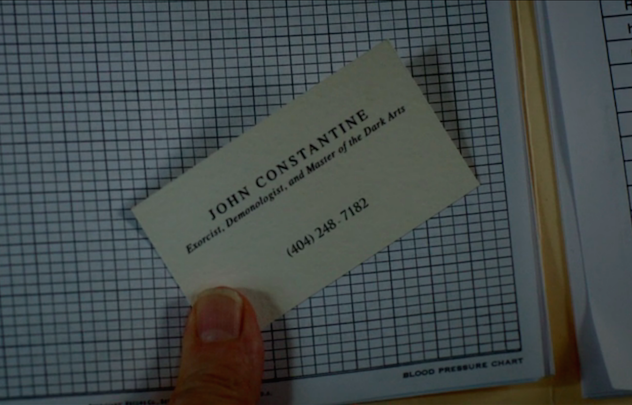 John introduces himself and gives Jim his business card, continuing the running “Master of the Dark Arts” job description joke. The team arrives on the scene of the car accident only minutes before Corrigan, who promptly arrests John for murder—John called Corrigan about the accident before it actually happened. That’s okay; the two of them needed time together for a quiet chat anyway. Chas goes back into town, now wearing a fancy bracelet John had pulled out of his Felix-the-Cat-like bag of tricks earlier, in the alley, to check for ghosts. The bracelet has a big gemstone that glows different colors to indicate the recent past or current presence of a spirit. As Chas passes an alley, the stone starts to glow. He is soon face-to-masked-face with the pretty killer scissor ghost. It turns out that “yes, you’re pretty” is also the wrong answer, and she brutally stabs Chas to death. 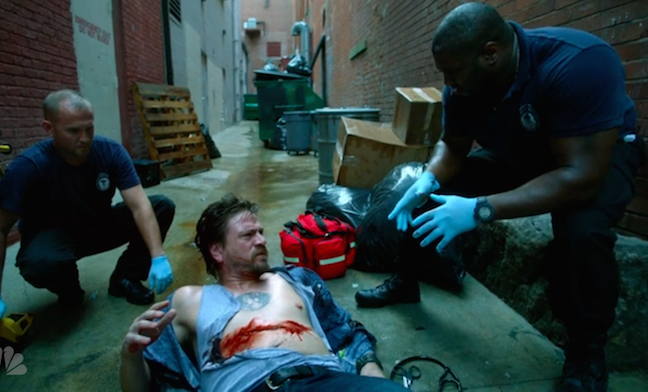 EMTs arrive at the scene of Chas’s murder and find no pulse, but as they are cutting open his shirt he wakes up, and we see his lethal abdominal stab wounds heal themselves. We still have no clue why Chas appears to be immortal, but it’s made pretty clear in this scene, if it wasn’t before, that he has Wolverine-like healing powers. While Chas is busy dying and revivifying, John talks to Tammy, the ex-model responsible for slashing the face of Misaki, the ex-ex-model. Zed talks to the grandmother of the dead hitchhiker. We learn what the two recently-returned spirits have in common, but it’s not a what; it’s a who—Papa Midnite. After losing his demonic recording due to John’s meddling in Chicago in Episode 3, he has returned to his New Orleans home, where he has been using voodoo magic to make contact with his customers’ dead loved ones for cash. Tammy and Grandma are both recent clients. Midnite is in the middle of a big flaming voodoo ritual dance party, communicating with a woman named Madeline Devereaux’s dead husband, Clark, when Constantine interrupts: “Papa Midnite! Helluva party. Sorry I came empty-handed; it’s hard to find a dessert that pairs with pig’s blood.” So rude. 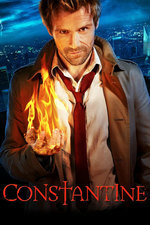 Papa Midnite isn’t doing a resurrection spell, and therefore doesn’t believe Constantine when he is told that the dead he is contacting have been rising. P. Middy blows some of his all-purpose magic dust into John’s face, which this time acts as a sleeping powder. John gets thrown in a car trunk while Papa retreats to consult with Cedella to decide if John’s story is true. Cedella Midnite, aka “Sister,” is Papa Midnite’s BFF. 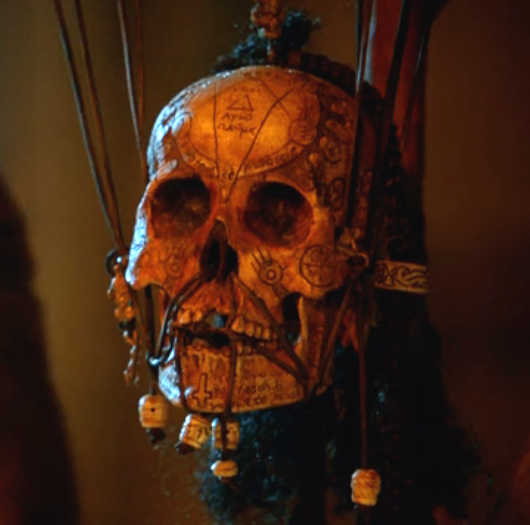 Her mundane form is that of the skull of a woman, presumably Papa’s own sister, whose soul is in Hell, thus allowing Papa Midnite to gain underworldly intel by asking her questions. By morning, Midnite has decided to follow up on John’s suggestion (given just before collapsing into the arms of Papa’s henchmen after getting the snootful of sleepy dust) to check in on one of his customers for proof. With John still locked in the trunk, Midnite’s driver takes him to the home of Madeline, his client from the night before. He finds her looking ashen and shaky, but elated—her dead husband Clark is home. Papa is disquieted to find that his voodoo is working in unintended ways, and that Madeline’s life force is clearly being drained by the ghost of the dead husband sitting by her side. 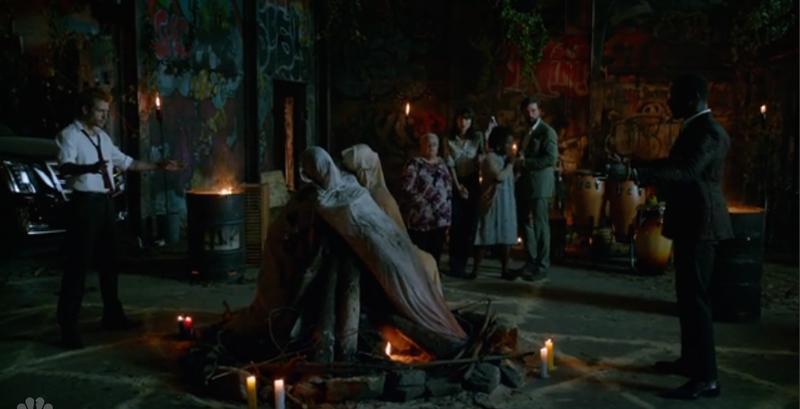 They bring the the bodies—Misaki, the sewing-shears killer; Philip, the hitchhiker; and now also Clark, the phantom husband—to Papa’s ritual circle and toss them onto the fire, teepee-style. John unceremoniously tosses his cigarette onto the pyre, igniting it, and begins chanting in Latin, while Midnite simultaneously bellows to the Loa in Louisiana Creole. It is all very dramatic—until the fire peters out, leaving the bodies barely scorched. 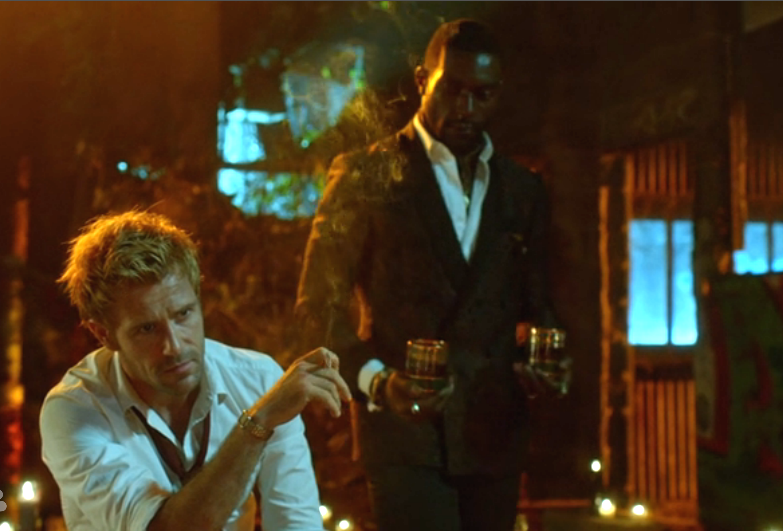 They return to their squabbling—Midnite says Constantine’s presence is disrespectful of the voodoo gods, and calls him “a magpie of magic—a thief of culture”—which BTW he totally is. But after smacking each other around a bit, “Johnny boy” gives his own self a smack when he suddenly realizes what the missing elements are—the three people whose guilt compelled them to seek out the spirits in the first place. The rueful living—Philip’s grandmother, Misaki’s attacker, and Clark’s wife—were the impetus for the return of the spirits, and their presence and consent is required for the banishment spell to work. Philip asks Zed to pull over instead of trying to scare her into the tree, and becomes a friendly ghost. The two stand in the road and chat as Jim goes off to collect the three guilt-ridden women and deliver them to Papa’s ritual circle, where their loved ones are set in a Boy Scout-worthy tripod formation and ready for burning. They express a decided lack of horror over this sight, and allow the ritual to continue while they watch. This time it works, and as the bodies go up in flames, the ghosts—one being bemused by Chas, one being calmed by Zed, and one at home wondering where his wife is—are released from this plane, and dissolve into wisps of spooky smoke. Homicide Detective Jim Corrigan looking unwell. Jim rejoins Zed on the wooded road after observing the successful ritual. he tells her that he recognizes her from past police work: “Your… family filed a missing persons report,” he says, pronouncing “family” as if it doesn’t seem like the appropriate word. He assures her that the report no longer exists, and bends to kiss her hand, triggering a dramatic vision—Zed sees Jim surrounded by a swirling mist, and casting an eerie green glow. Blood pours from his chest and face. He looks almost—what’s the word—Spectral! But again, we don’t know if Zed’s vision is of the past, present or future—we’re guessing the future, though, as we’re pretty sure only the living are capable of being drunk all the time, as Detective Corrigan, NOPD’s finest, is. Cedella in happier times. Hellblazer #72, “Brave New World.” Ennis/Dillon. And again we are left with the lingering question of who can truly be trusted. 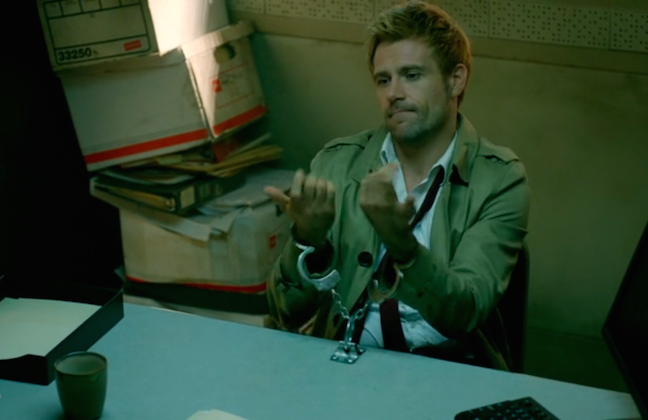 The show continues to find its feet as the character of Constantine exposes his own true colors, being often hilariously arrogant and cheeky. He also smokes throughout the whole episode. 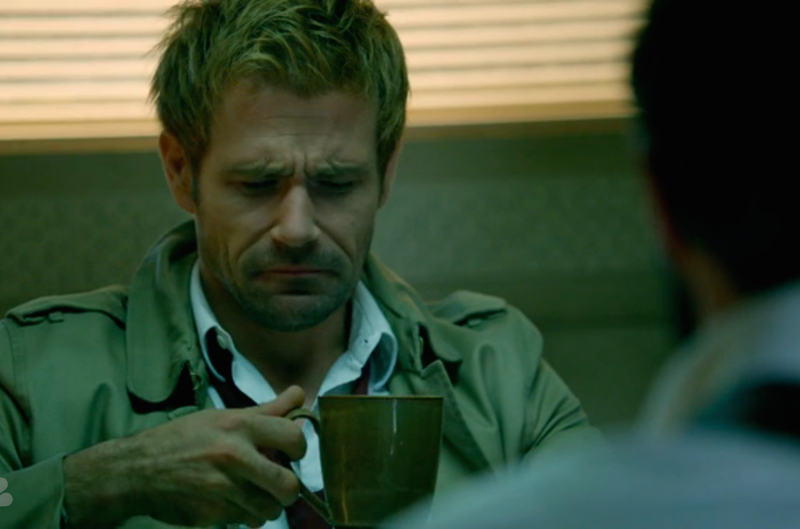 (Okay, we know smoking is bad, but Constantine would not be the same without his dangerous habit, so it is actually sort of a relief to see him with that ingrained part of his personality intact through the good-show-killing wringer of network TV.) We also continue to be charmed by his oh-so-British manner of speaking. In short, Matt Ryan is nailing it. Zed (Angélica Celaya) is also developing as a character. She has both supernatural and human skills that John and Chas lack that make her an essential part of the team, and her resting weirdness-face is seriously growing on us. And while the character of Chas, played by Charles Halford, is not much like that of the comic (his newly fixed-up classic English Cab, though, is still a joy to briefly behold), we are interested to learn more about his story and where he acquired his super-handy healing powers. Michael James Shaw continues to impress as Papa Midnite, too. We’re already regretful that this season will only include ten episodes. Not regretful enough to resurrect the dead or anything, though. NBC is stopping production, but it’s not too late! A ratings boost could save the show, so for those of you who live in an area where you can tune in NBC (unlike some of us, who have to watch on Hulu), keep watching or buying! That is a bummer. There are so many bad shows on the air, why get rid ones of the few interesting and exciting ones? I hope they still get a second season next year even if they don’t continue production this year. Let’s hope there is a surge in viewership.